The 29th Canadian Armoured Reconnaissance Regiment (South Alberta Regiment) was formed in 1940 from five western Canada militia units. Almost forgotten today, the SAR formed a splendid combat record and was the only Canadian unit to receive the Victoria Cross during the Normandy Campaign of 1944 and the only Canadian armoured regiment to receive that medal during the Second World War. The story of this proud unit of "boys from the bald-headed prairie" is a chronicle of gallantry, sacrifice, military professionalism -- and humour, for although the South Albertas took their soldiering seriously, they never took themselves seriously and this trait will endure them to readers who follow them from the Rockies to the Rhine. Three chapters deal with the SAR's most famous action, the Battle of the Falaise Gap in August 1944, where Major David Currie earned the Victoria Cross in four days of vicious fighting. Based on new research in French, German and Polish sources, this is the most complete account of this action to appear in print. Lavishly illustrated with maps, photographs, cartoons, scale drawings and rare wartime photographs, South Albertas also contains appendices dealing with military terminology, armoured vehicles and armoured tactics. It will appeal to those interested in military history, arrmoured warfare during the Second World War, and the meaning and the cost of courage. "a rare combination; a first class beer-and-popcorn read that is thoroughly researched, well illustrated, balanced in its conclusions, and -- most important for today's armor leaders -- full of insights which are still useful. ...... Good history in an attractive package, it is suitable for coffee tables and professional libraries alike." "But above all, South Albertas presents the gripping, human story of young men who demonstrated the meaning of courage and its cost." "This is a story with the average reader in mind. It is based on exhaustive research (often using sources that were previously largely unused) and extensive interviews. It presents a vivid and compelling tale of Canadians at war. ...... Written in plain language, this is a large, beautifully-produced work, full of maps, charts and photographs..."
"This book is truly impressive in its scope ...... It treats the true heart of any regiment, its soldiers, with respect -- indeed affection -- tracing the stories of private soldiers as well as officers, giving the atmospher of a family, which indeed a regiment in combat must be. .... a regimental history that is both easy to read and enjoyable!" 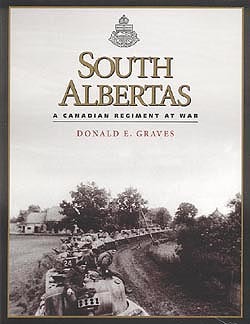 "Graves amply demonstrates his considerable talent as a military historian in his superbly detailed descriptions of the battle in which the South Alberta Regiment played an inmportant part" and "tells the stories, warts and all, of the men who did the dirty work of fighting our wars and of those who inspired and led them, and it does this in such a way that the unit's past is made vivid and relevant ...... good regimental history at its best!" "Donald Graves has written not just a singular account of the war but instead created a broader, well balanced work that satisfies both the former member of the SAR and the general reader/historian as well. ...... There is also the added bonus to this history of the absolute wealth of previously unpublished or rarely seen photographs of a Canadian armoured unit at war. ...... Without a doubt the South Albertas is one of the finest unit histories ever published and in fact transcends the genre to rate as a truly great history of Canada at war." "This remarkable book is first and foremost a regimental history ..." [but it is also] "an account of the Canadian campaign in North West Europe that rivals anything I have ever read on the subject. South Albertas provides an object lession on the working of the regimental system where it matters most -- in war. ...... should be required reading for any student of the campaign in North West Europe." "a book combining the feel of an informal scrapbook shared among old friends and the meticulous report of the combat record of a spearhead formation. ...... Handsomely done. A fine history of a fine unit."